If you’re a driver who’s constantly on the go, consider a 2017 Nissan Sentra NISMO. 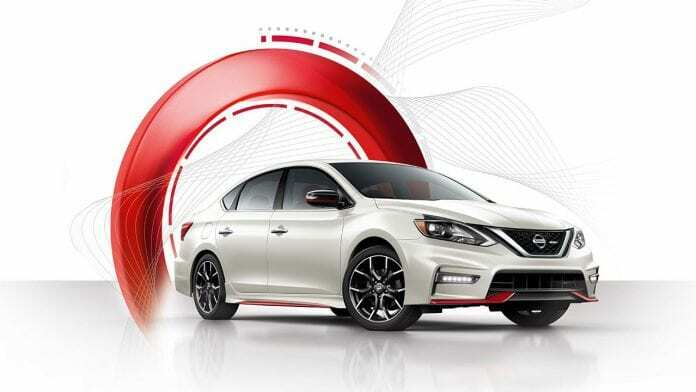 It’s A 1.6-L DIG™ Turbocharged engine gives Sentra NISMO equal parts power and fun-to-drive performance. It’s masterful engineering that meets the high standards synonymous with NISMO. NISMO’S sporty 18” aluminum-alloy wheels will help get you there—no matter where it is. They’re wrapped in aggressive P215/45R18 all-season tires. The Nismo is oh-so color coordinated while you’re on the go. Its red-stitched leather-wrapped shift knob echoes the sporty style you’ll find throughout the cabin. The signature NISMO red tachometer is a NISMO tradition. This cool signature red tachometer provides a unique touch that expertly melds form and function. Branded front sport seats are track-inspired that help keep you hard-wired to your drive. Aggressive bolsters give you a reassuring hug in the turns, while the two-tone, red-and-black synthetic suede appointments appeal both to the eyes and to the touch.